I hope you've all enjoyed your holidays so far and that the New Year will be full of good health, hope, happiness and peace on Earth for all. 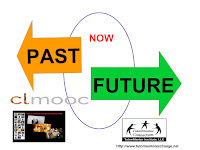 In this article I'm going to share a journey I've taken with the Connected Learning Community (#clmooc) over the past two weeks, and the past five years. I hope you'll follow along and dig into the links. The image above is the first page of a slide show I created this week. The image below is page two. 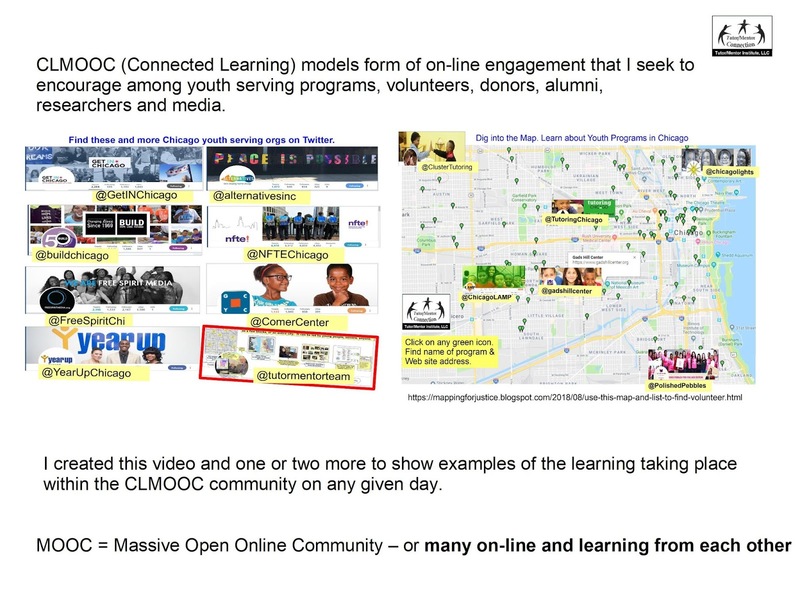 It shows my goal of connecting leaders, staff, volunteers, donors, alumni, researchers, media and others in an on-line community similar in practice to the #clmooc community. 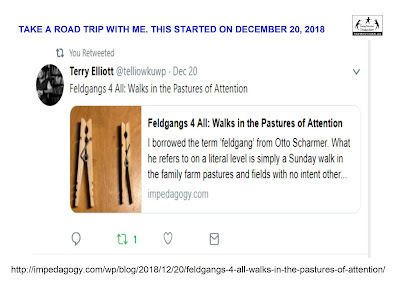 Just before Christmas I saw a post on Twitter from Terry Elliott, who I've followed for the past five years. As I do often, I clicked on the link and went to Terry's blog to see what he was writing about. 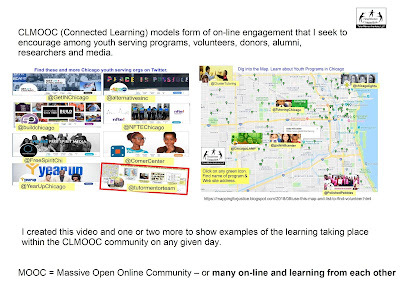 The slide below shows one section from Terry's blog, and illustrates a common feature of the #clmooc community. 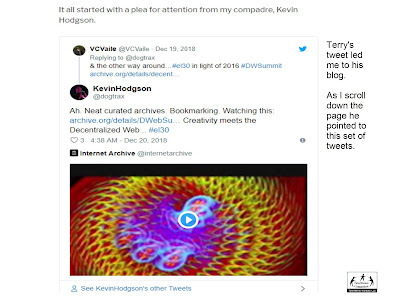 Terry has embedded a Tweet posted by Kevin Hodgson, another member, who is a 6th grade teacher from Western Massachusetts. 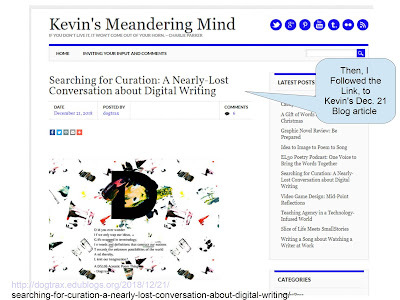 Kevin frequently embeds videos, music and cartoon graphics into his articles and his Tweets. Moving further down on Terry's blog you'll find the section I'm showing below. One reason I visit Terry's blogs is that he's constantly showing ways to use different digital tools. 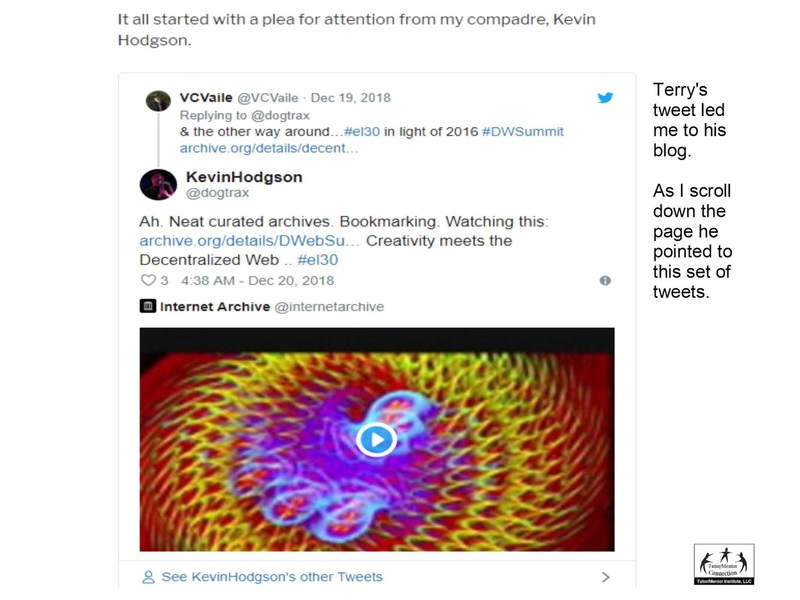 Here he's created a video to show the Internet Archive, then he's sharing the annotated version that he posted on Vialogues. 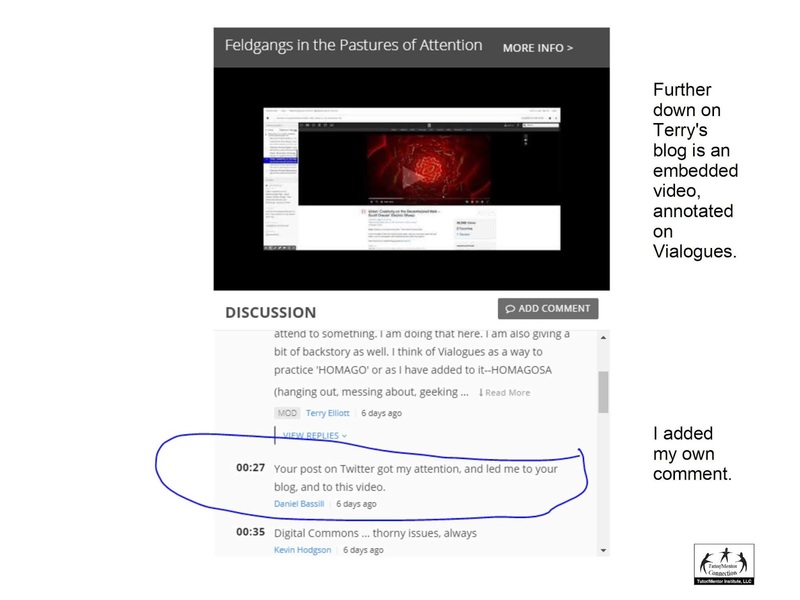 I circled my comment, where I said "Your post on Twitter got my attention and led me to your blog, then to the video." It's also part of what prompted me to create this blog article! After reading through Terry's blog I went back and opened the link to Kevin's blog. The slide below shows the top part of the article. 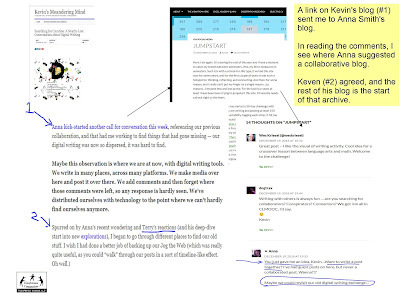 Along the right side you can see topics of articles Kevin has posted recently. This is a feature of most blogs, which makes each of them an archive for learners. 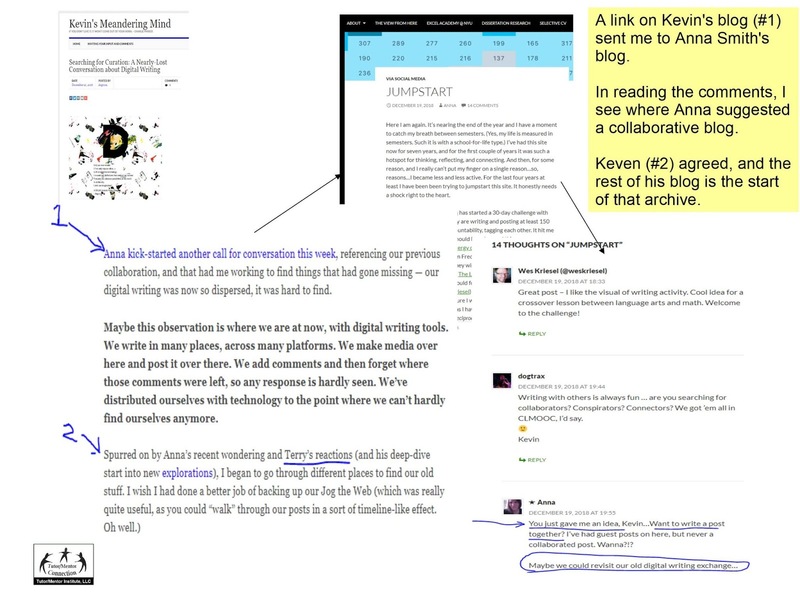 The slide below shows the first part of what I found as I started reading Kevin's blog article. He starts out, writing "About six years ago, in 2012, my friend, Anna Smith, and I had a conversation. A chat about Digital Writing. Through digital writing. With meta-explanations of how we write digitally, pulling back the veils on our process notes. Others, like Terry, joined in. We wove this all together, somewhat through our blogs and through the National Writing Project’s Digital Is site, and curated the conversation through a site called Jog the Web." He followed with a paragraph, pointing to a blog by Anna Smith (#1), which I opened and read. In the comments section Anna responded and suggested creating a collaborative blog article with Kevin. Then (#2) he responded in his own blog showing how Anna and Terry's articles had motivated him to start digging through the web archives of a writing activity he'd done with Anna. Below is a slide showing just part of what Kevin included on the rest of this article. He used a combination of videos and cartoons to not only show what he was finding, but to walk through the process of building the archive. 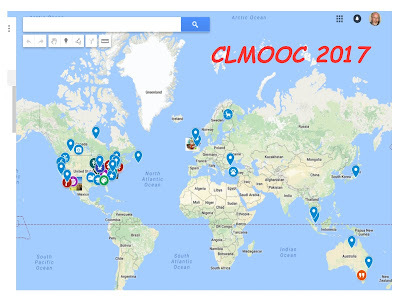 He also issued an invitation for others to join in, which is a common feature of the #clmooc group that I really welcome. So, I did. I spent a few days trying to think of how I'd point to archives of my interactions with #clmooc, and how I'd relate this to my goals of having other people look at my web sites and strategy presentations, the way interns had been doing, which would lead to new (and better) versions reaching more people in more places. This is what I created. Open this link and then follow from left to right. In each node there is a small box at the bottom, which includes web links to all of the articles I've mentioned so far in this article. I intended to create a video to walk people through this journey, and created these slides as visual aids. Unfortunately the screen recorder I'm using (or my mic) is not working properly and the audio is really bad. Thus, I've created this blog article. This is the upper left section of the map, containing links to information I wrote about above. In this section of the cMap I show how I've archived my 40 year involvement with youth tutor/mentor programs in Chicago and the formation of the Tutor/Mentor Connection in 1993. I also show my digital learning life, and point to some email and blog articles from the late 1990s and mid 2000s that illustrate my involvement. Then, I used this section to point to some of the #clmooc articles I've posted on this blog since 2013. While many of these point to interactions I've had with Kevin and Terry, there are many other educators in this community whom I've enjoyed connecting with and learning from. 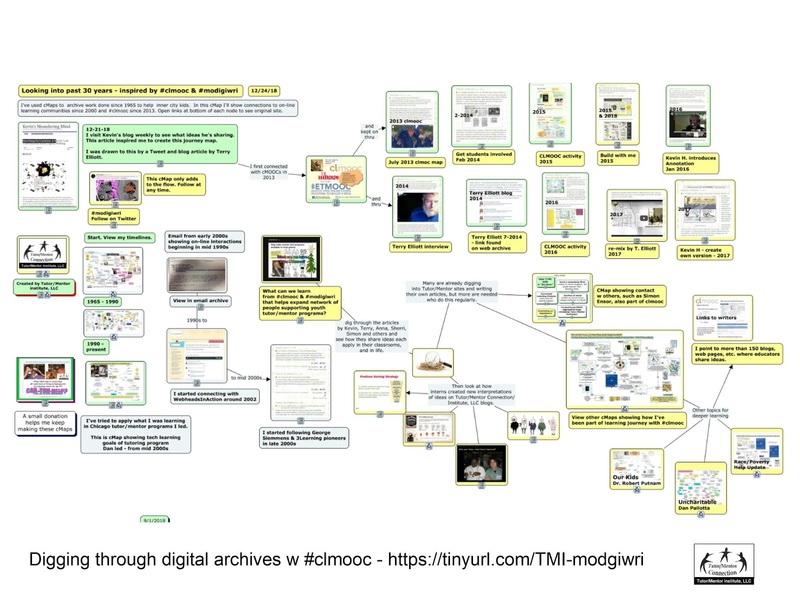 The blogs I point to on this cMap are just a few of more than 100 articles I've written that point to #clmooc, MOOCs or similar on-line learning communities. You can find these if you scroll through the tags on the left side of this blog. The next part of the map points to some of the work done by interns who worked with me from 2006 to 2015. 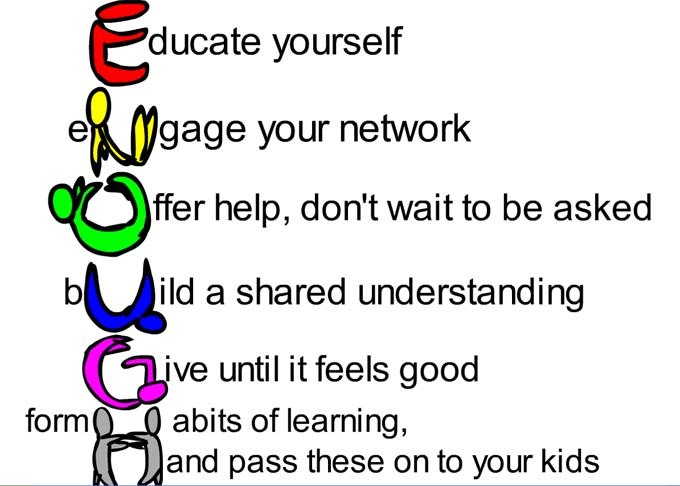 Their work is a model of what I hope educators from #clmooc and other communities will do. One thing you'll see very quickly if you start reading blogs by #clmooc members is that they all are better writers than I am, and far more knowledgeable and creative in using video, music, animation and other digital tools. That's what inspires me. What if people with far more talent than I have are creating articles with the same ideas and messages that I've been trying to communicate for the past 25 years? Could we have greater impact if this were the work of hundreds, or thousands of people? Yes. I believe so. The final part of the map, in the lower left, points to some things people might investigate, such as the "Our Kids" book by Robert Putnam, or the "Uncharitable" book by Dan Pallotta. I hope you've taken time to read this. It's a form of engagement and learning that anyone can be part of. It just requires a personal commitment to spend time reading, watching and engaging. It's a dynamic process, in that everyone is adding new content every day. You can join at any time. Do as much, or as little, as you want, or have time for. I normally put hyperlinks in my blog articles pointing to the web sites and blogs I'm talking about. I did not do that here. Instead, I hope you'll open the concept map, then open the links under each node, which are the sites I've referred to. If someone wants to create a video narration of this, please do. If you can suggest other easy-to-use, high quality, FREE, screen capture sites, that would help, too. Thank you to those who have already send contributions to my BirthdayFundMe campaign or my EndofYearFundMe campaign. This blog is part of what you're helping keep alive with your contributions. 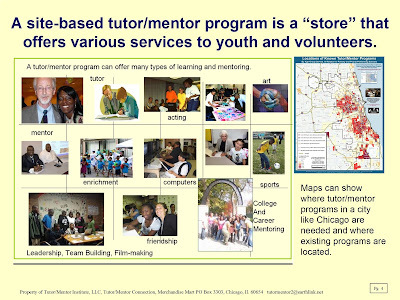 I created the Tutor/Mentor Connection (T/MC) in 1993 to help volunteer-based tutor and/or mentor programs grow in all high poverty neighborhoods of Chicago. While I led this under a non-profit structure until 2011, I've led it through the Tutor/Mentor Institute, LLC since then. I've never had consistent funding to do all I was trying to do, and resources have been more difficult to find in recent years, yet, if you read articles on this blog, you'll see what I'm doing. Below is a concept map showing milestones over the past 25 years. 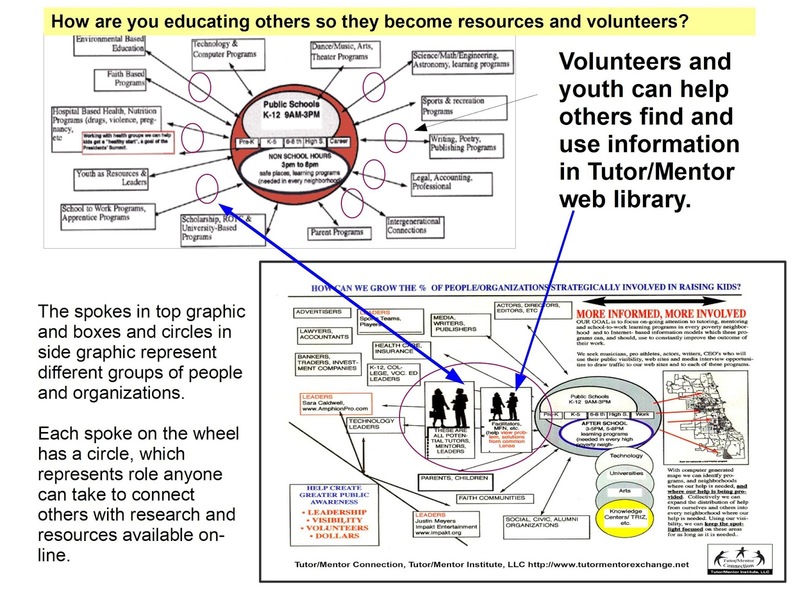 I keep drawing from this experience to try to help versions of the Tutor/Mentor Connection grow in other cities, helping build systems of support for economically disadvantaged youth in more places. Here'as a link to my holiday appeal letter, and here's a direct link to my FUND ME page. Your help keeps my voice and ideas available in 2019 and beyond. I'm being a bit creative today. 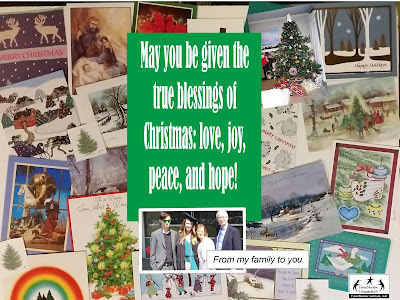 Below is a holiday greetings made from a montage of cards my parents received between 1950 and 1992. Instead of one card, I bring you holiday greetings from many cards. 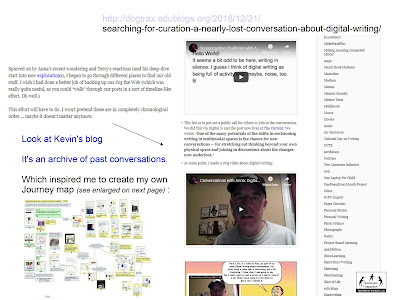 Below that is a GIF I made to draw attention to a learning activity going on now, involving #clmooc educators from around the world, who are looking backward at work done in past years, while looking forward to ways they can use digital writing to communicate ideas. The hashtag is #MoDigiWri. I created the GIF below as part of a project I'm doing that points to my past connections with #clmooc, and their work, and ways what they do could be duplicated by others. I'll have my project on line in about a week, but you can dig into the links above and join this activity. Yesterday more than 90 people posted "Happy Birthday" greetings to me on Facebook and other social media. I responded to many with thanks and a few other comments, but also began to build a list with the goal of creating a group message, which I posted today. See it here. 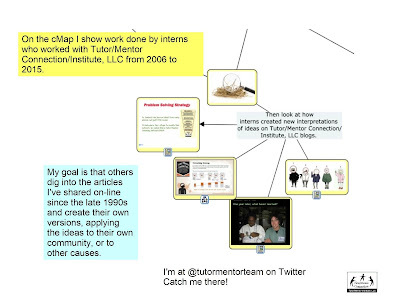 This is one page from a 2012 presentation (click here) that shows different groups of people whom I am connected to on Facebook, Linkedin and Twitter. The major clusters are my extended family, with members spread on East and West Coasts, as well as Chicago area. Also my Illinois Wesleyan University Acacia Fraternity network, which also has members spread around the country. 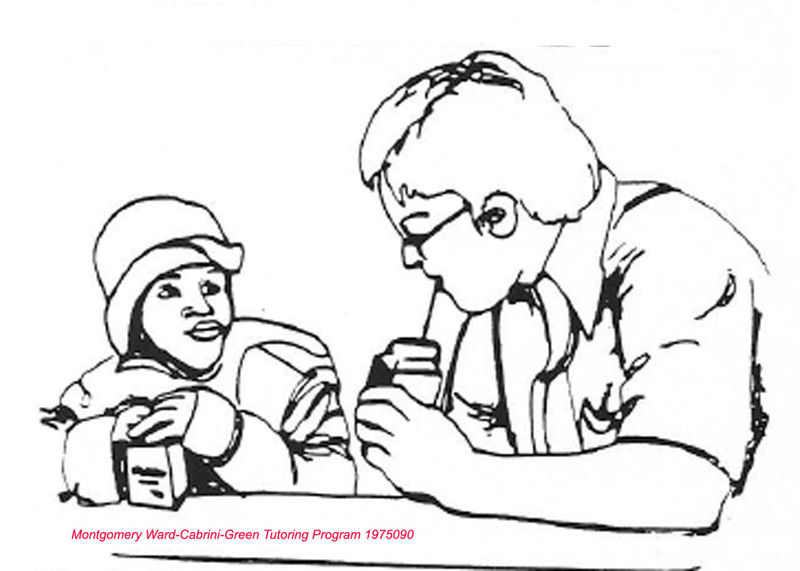 It includes connections to former students and volunteers from the Tutor/Mentor programs I led between 1975 and 1993 (which I joined as a volunteer in 1973). It also includes people I've met as a result of the work the Tutor/Mentor Connection has done since 1993 and the conferences I hosted from 1994-2015. Finally it includes a growing network of people who I've met on line in idea sharing communities. Since this is from 2012 the composition of the network would be much larger today, 2018. Most of the people in different parts of my network don't interact with people in other parts of the network. Heck, some from within clusters, like my extended family, don't know people from other parts of the family tree. Yet, we all are living in a world with many problems that we can't solve working alone or in small groups. I could have chosen a number of different graphics to communicate the idea I'm trying to share. 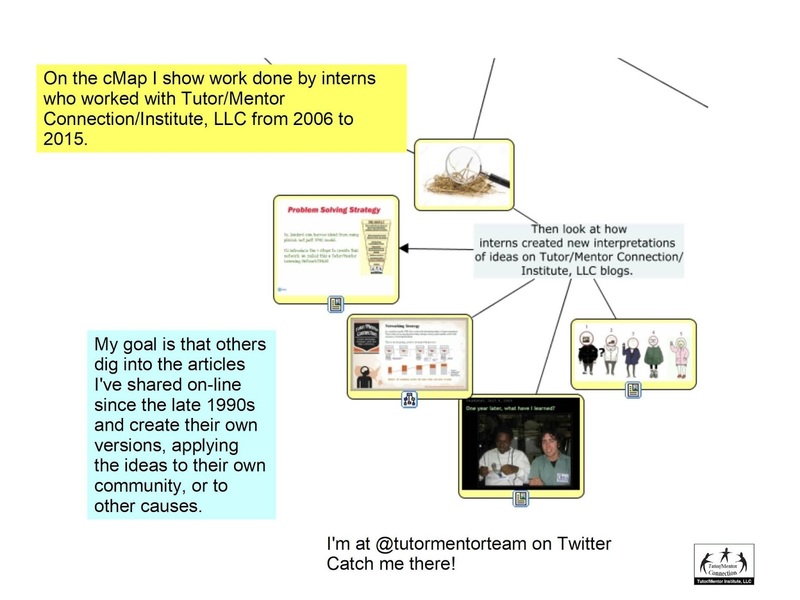 Do a Google search for "tutor mentor network building" then look at the images. You'll see many with this same idea. Each of the people who sent me birthday wishes could be reading my blog articles and simply sharing them with their own networks, using social media. That's what Tramaine Ford, a former Cabrini Connections student, did with this FB post. Or, they could look deeper, then create new versions of the articles, and new ways to share the ideas, using video, animation, long or short form writing, etc. We all are part of many networks. The problems we face in the world cannot be solved by one person, or small groups, working alone. Finding ways to connect people in your network with information and ideas, and with each other, is one solution. This ENOUGH graphic is an example. I started this in 2007 and an intern from South Korea created this graphic and an animated version a few years later. I put it on video last year. Click this link and see several articles where I've used this. Apply these ideas in 2019 and when it's time for my birthday again in December 2019, bring your network and tell me how you've used these ideas. Thanks to those who have given birthday gifts. I'm still seeking help. Please read my appeal letter and add your support. It's my 72nd birthday on December 19. 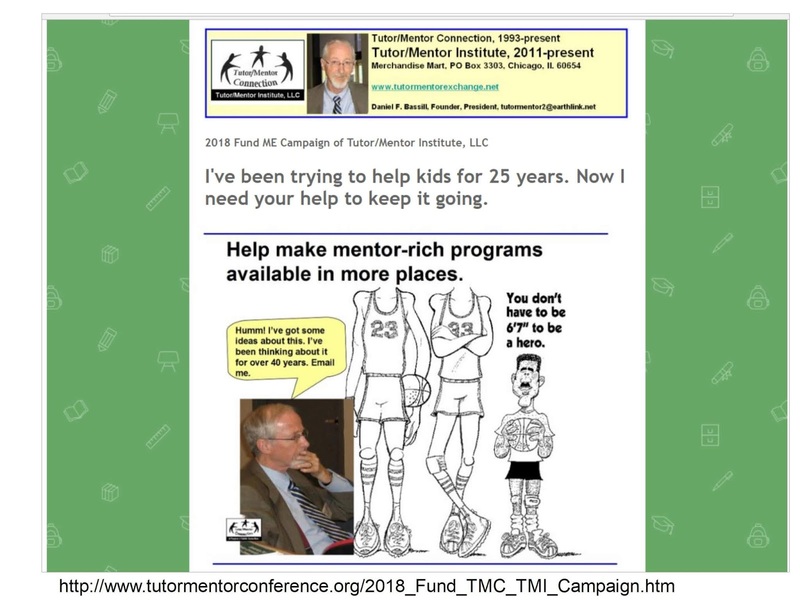 I'm also celebrating the 25th anniversary of creating the Tutor/Mentor Connection (T/MC) in 1993. I invite readers to help me celebrate, and keep the T/MC vision alive with a gift to my Birthday Fund. Can you Help Me Help Youth In Chicago and Other Cities? Below is text and images from a letter I've just mailed to people who have made financial contributions to support this blog and the work I have been doing for the past 25 years. I hope you'll read and respond. It's the Holiday Season and I hope you and your family will enjoy all of the blessings that this season brings to many, but not all people in America. This is the 25th Year Anniversary of forming the Tutor/Mentor Connection in 1993. 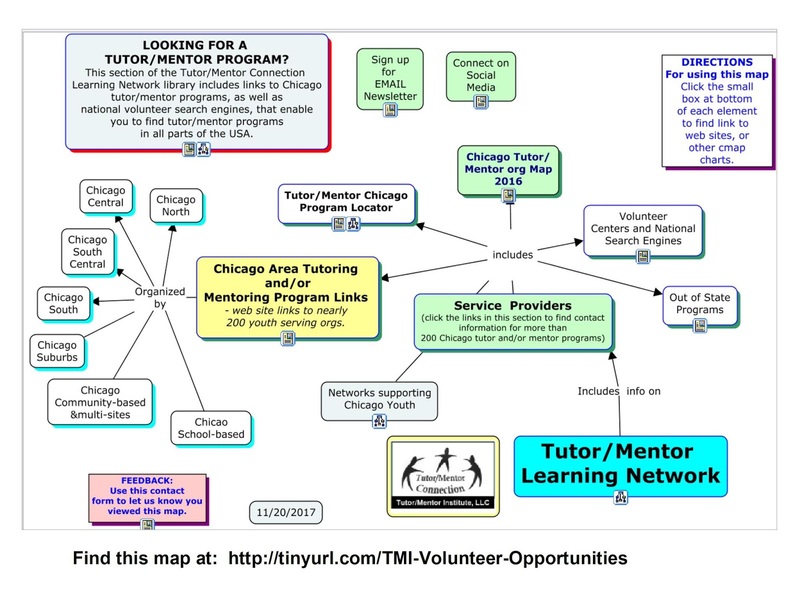 In 2011 I created the Tutor/Mentor Institute, LLC to keep this available in Chicago and to try to help similar models grow in other cities. I've been sending you updates, asking for your support, in the seven years since then. 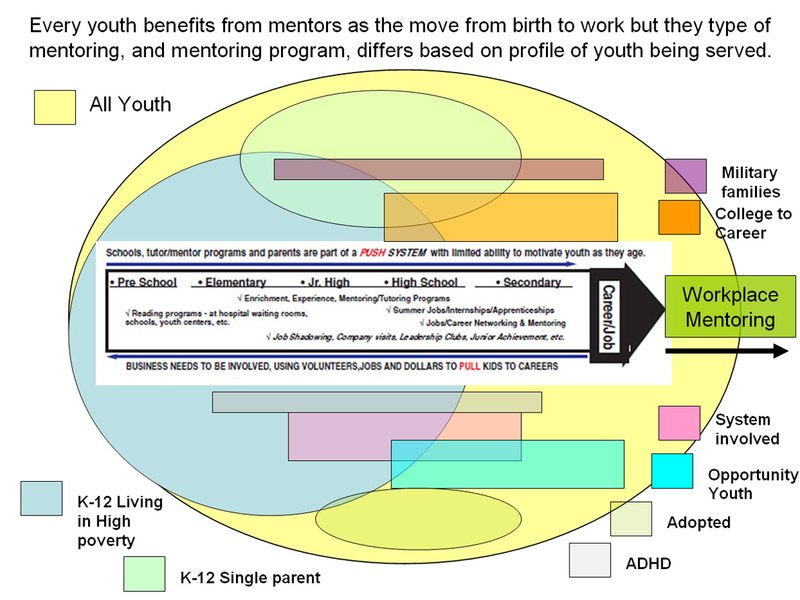 My aim is to provide ideas that others use to build systems of support for kids in poverty, and to serve as a model that you and others duplicate, telling the same stories, to people in your own network, expanding the number of people looking at these ideas and using them to build strategic support for k-12 youth. 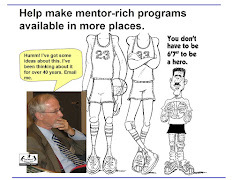 For 35 years I led a volunteer-based tutor/mentor program, so developed a deep commitment to the potential of well-organized, mentor-rich programs. 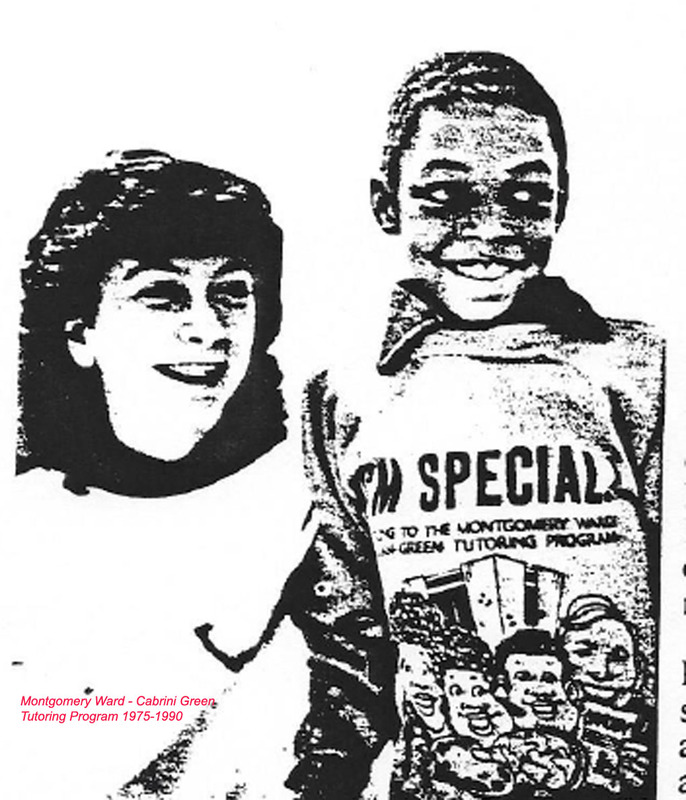 When we created the Tutor/Mentor Connection in 1993 the goal was to build a database of existing Chicago programs and a library of information and ideas, then find innovative ways to draw more frequent attention to tutor/mentor programs as a way to help kids and a way to get more people involved. Borrowing from my work in advertising with Montgomery Ward, the goal was to draw more customers (volunteers, donors, media, etc.) directly to each program in the Chicago region. The graphic at the right is similar to many that you'll find in my blog. 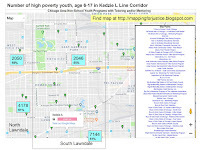 It shows my role as an intermediary connecting people who can help to an information base, including a list of Chicago youth programs in places where help is needed. This is part of a four-part strategy that I launched in 1993 and still follow today. Ever since starting the T/MC in 1993 it's been difficult helping others understand what it has been trying to do. Part of the challenge is that philanthropy encourages competition among non-profits. Few work together to generate the resources that would help great programs grow in more places. In addition, few in leadership roles have ever taken the time to build a database of programs and then use it in on-going efforts intended to help every program get the resources each needs to be successful...the way that corporations support multiple stores reaching customers in many locations. That's why I keep repeating "Read my Blogs!" If you read the articles consistently, you'll understand what I'm trying to do, and you might help find others who want to bring these strategies into their own leadership efforts. 3. at the city/regional level, making sure ALL high poverty neighborhoods have great programs. This map shows that poverty has many entry points, many challenges. That means that people who are donating time, talent or dollars are working in many different, but often disconnected, efforts. The competition for resources at every level is fierce, meaning consistent long-term solutions are difficult to find in many places. 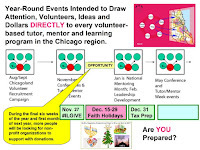 During the past year I've continued to add new links to the web library at http://tinyurl.com/TMC-Library and continue to maintain a list of Chicago area non-school tutor/mentor programs at http://tinyurl.com/TMI-ChiProgramLinks I've also continued posting strategy ideas on Scribd.com and Slideshare.com, which I then point to in my blog articles. I spend time each day sharing these ideas in social media channels and trying to connect with people from Chicago and around the world who might use these ideas to help needed programs and services grow in all places where kids need help moving through school and into adult lives. I continue to offer free advice to any who request it, while also looking for ways to earn income from sharing what I know. I still have not figured how to make that work. Nor have I found 3 or 4 people who would share the vision, and responsibility, and form a new non-profit Tutor/Mentor Connection. Thus, I continue to look for contributors who will help fund my efforts. I'm still not able to offer you a tax deduction, since I don't have a non-profit status. There are two ways for you to offer financial support. If you cannot make a contribution, please read my blog articles and share them with others. If you use Twitter, Facebook or Linked in, please connect with me, which helps people in your network find the information I'm sharing. Thank you to everyone who has contributed to support this work in the past. If you'd like to talk to me, email me at tutormentor2 at earthlink dot net to arrange a time to talk by phone, Skype or in person. Can we imagine a future without traditional schools? Last week I stumbled upon a Twitter chat which includes school superintendents from the Chicago area. I added the hashtags #suptchat and #k12prchat to my hashtag map, with the goal of going back this weekend to review all of the posts. I followed the link and read this article, titled "School’s Out: Who Takes Responsibility for the Education of Young People?" The article uses words to visualize an idea that I've used graphics to communicate. What I was seeing in my mind was the graphic at the top of the visualization shown below. It shows the community of people surrounding kids as the grow up and lead their adult lives. The spokes lead to different work/life experiences which offer different forms of learning and career opportunities. 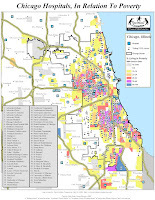 In the lower part of this graphic I show a map of Chicago, with poverty areas highlighted. To the left of this is a circle, representing "all the knowledge in the world" that is available to young people and adults. 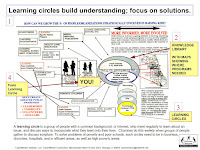 To the left of that circle and in the smaller circles below, I visualize the idea of gathering people together to discuss this information, and to learn how such learning is less available to kids in high poverty areas due to the lower diversity of people with different types of jobs, careers and incomes. 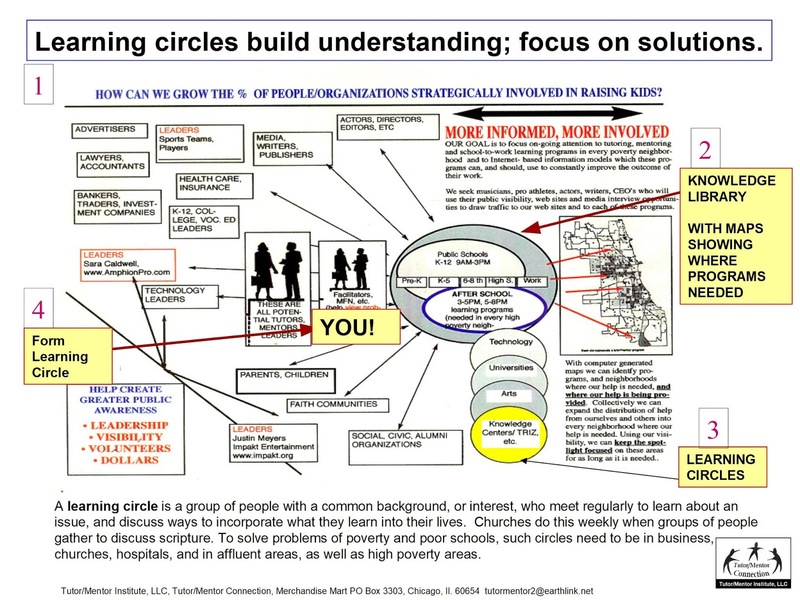 Thus, the goal of the discussion is to find ways to make this type of a learning environment more available throughout Chicagoland, Illinois, the USA and the world, so that at some point you could look at maps and see a distribution of mentor-rich learning opportunities distributed like Christmas lights on a tree. Hopefully, no spaces are left uncovered. This is one of many articles where I show uses of maps. 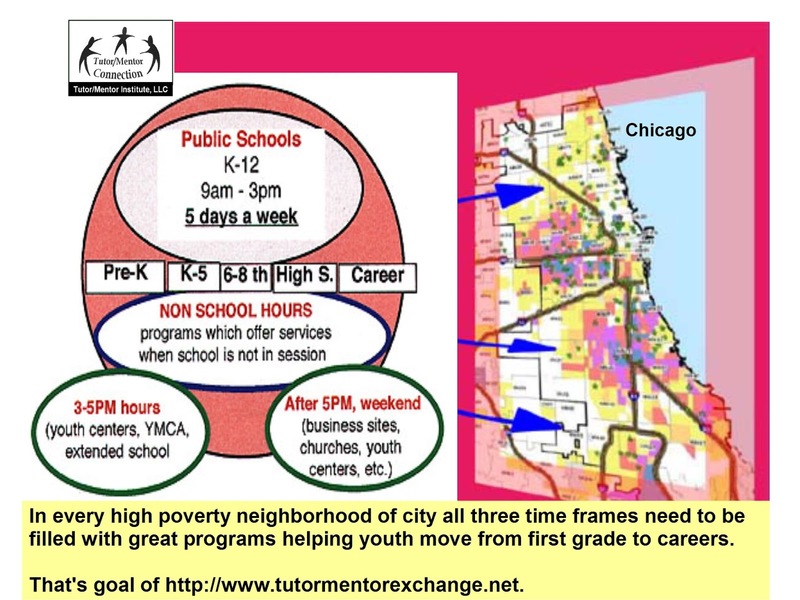 I first created this graphic in the 1990s to visualize the type of non-school tutor/mentor program I had led in Chicago since 1975 and to show a program design that others might duplicate. At this link you can see this idea in more detail. Below is another Tweet from the #suptchat thread. Twitter chats enable people from schools, non-school organizations and all sectors to engage in conversations that focus on the well-being of youth, families, our communities and the world. We just need to find ways to draw more people, from more places into these conversations. 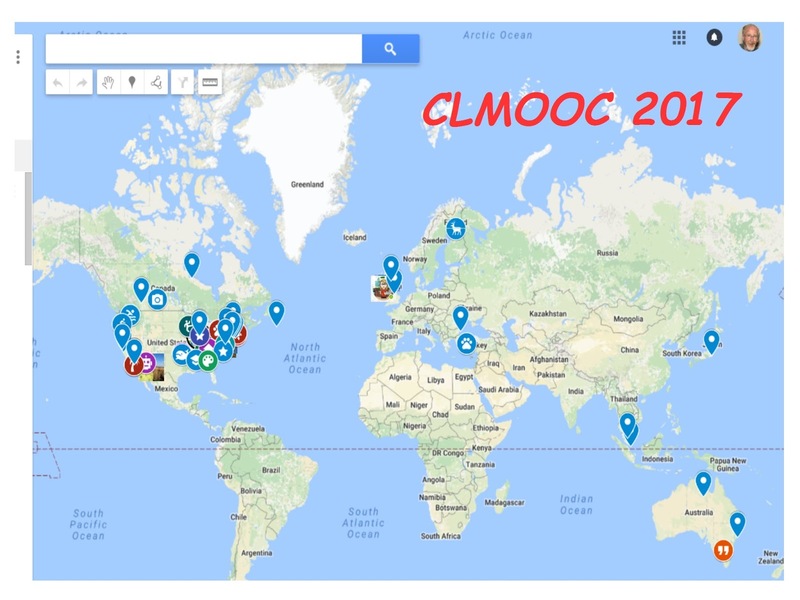 That's why I've encouraged people hosting events and chats to create participation maps, like the one shown below, which is for the 2017 #clmooc, connected learning group. With participation maps we help people connect with each other. We also enable a conversation of "who's here, and who's missing". 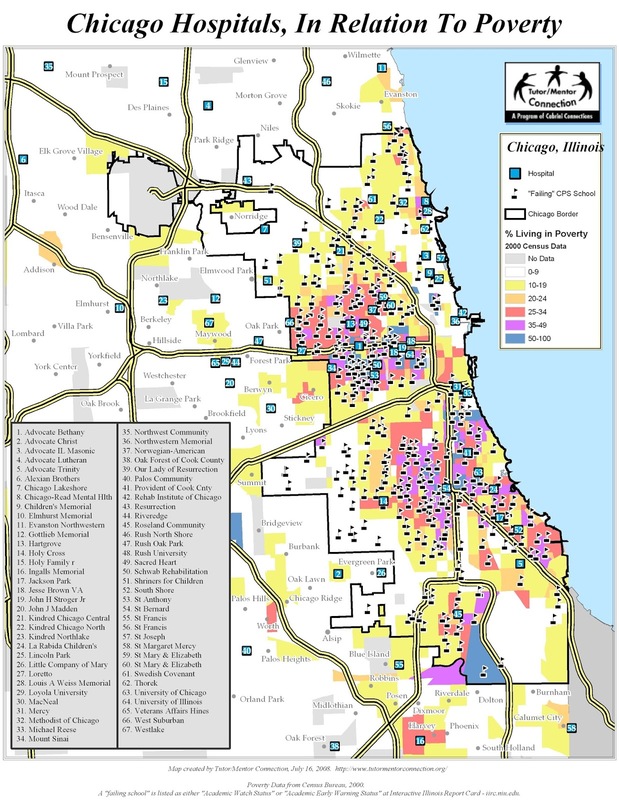 For instance, if you zoom into this map, you'll find few people from the Chicago region and other metros, which serve large numbers of low-income kids. The data can encourage discussions of why, and what can we do about it. To me, this is part of the learning that is available to those who spend time connecting and looking for ideas. That's what I have been doing since I started leading a volunteer-based tutor/mentor program in Chicago in 1975. Initially, I built a library of books and tutoring ideas and encouraged volunteers to use this to support their own work with kids. 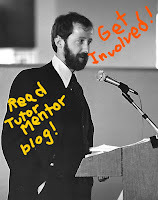 In 1993 when I created the Tutor/Mentor Connection, I began expanding this library, while also building a list of Chicago non-school tutor and/or mentor programs. Then I shared this with others, via a quarterly print newsletter, and bi-annual conferences. 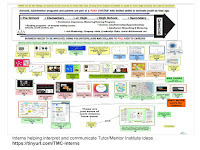 In 1998 I launched the Tutor/Mentor Connection web site, and in 1999 the Tutor/Mentor Institute web site. Both enabled visitors to connect with a wide range of information, ideas, program models, philanthropy resources, and more. I'm still doing this, but without a non-profit organizational structure or reliable revenue stream. Thus, I share this FUND ME campaign page, inviting any who have read this far to make a contribution to support this work. It's the annual GivingTuesday (#ILGive) in Illinois and hundreds of non-profit organizations are using email, web sites, social media and a variety of other tactics to try to attract donors. Below are a few thoughts for this day. First, youth tutor and mentor programs are competing with a wide range of other important causes for limited donor attention and dollars. My efforts for the past 25 years have been to create a greater daily frequency of stories talking about where and why tutor/mentor programs are most needed, ways to help them (time, talent and dollars), and ways to find out what programs are operating in different parts of the Chicago region. 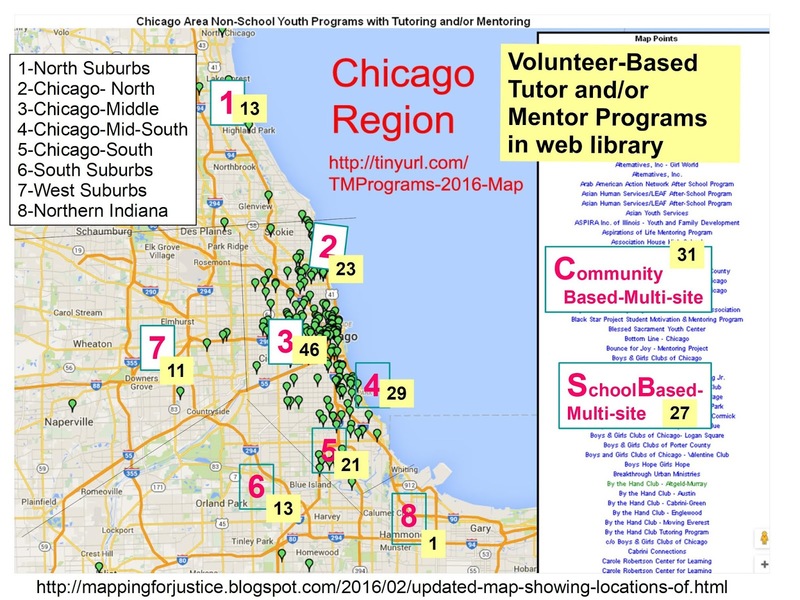 I've been plotting locations of Chicago youth tutor and/or mentor programs on maps since 1993. In 2004 we were able to create this on-line search page, to help you find programs, based on what type of program (pure mentor, pure tutor, combination tutor/mentor), age group served (elementary, middle, high school) and location. Then in 2008 we created this interactive map that provided the same search feature but showed the entire Chicago region. 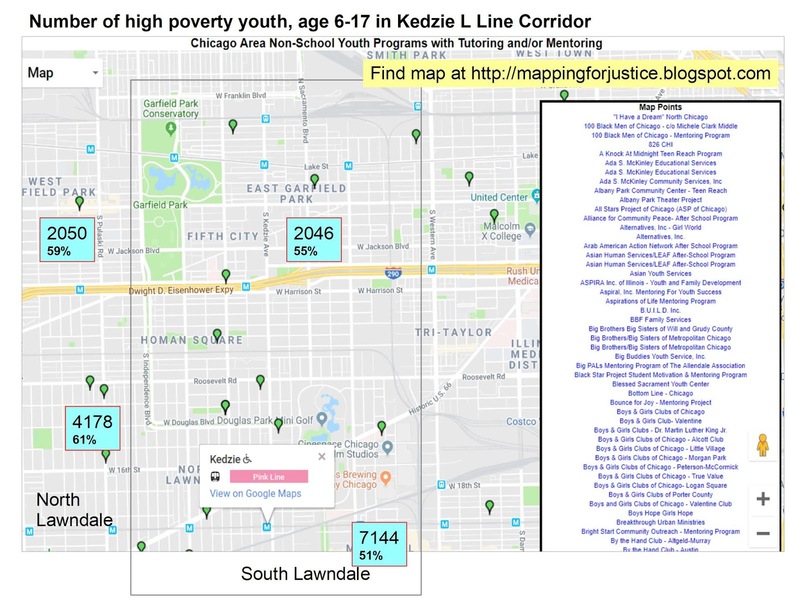 Those have not been updated since 2011 due to lack of funds, so I created the map shown above in 2016, to provide information about existing youth serving programs. Visit this page to see the map and my list of programs. I've also created this concept map, to help people find youth serving organizations, based on the lists I maintain, and based on lists others are building. 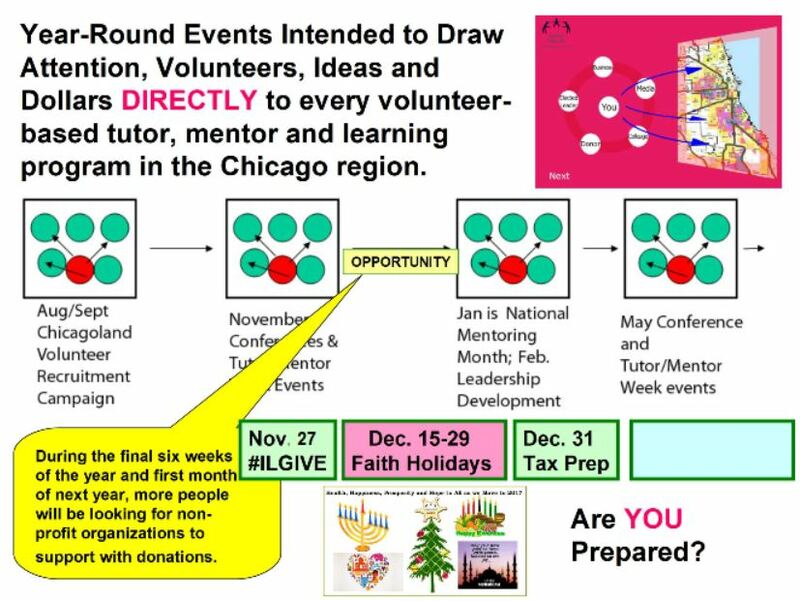 If I had the talent, time and money, I'd create a #GivingTuesday map, showing which of the tutor/mentor programs in Chicago were running campaigns today via #ILGive or other platforms. 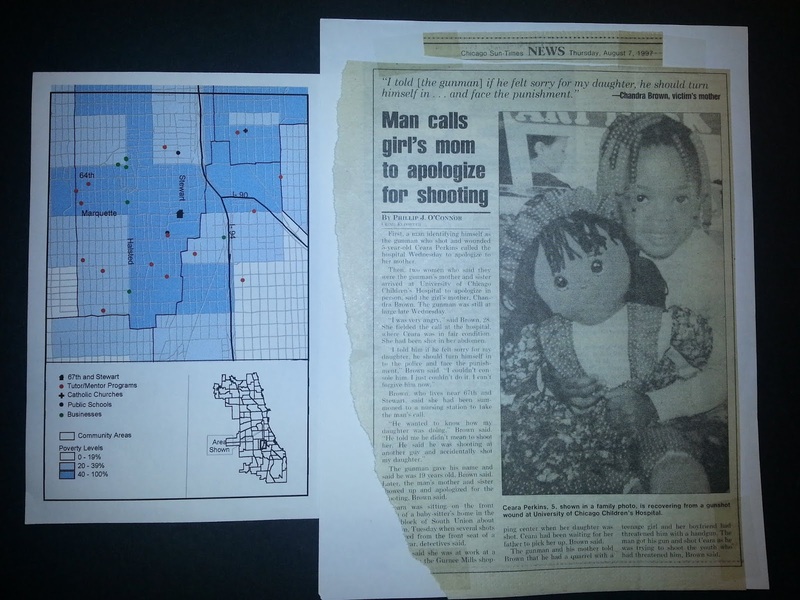 In addition, I'd be reaching out to schools, non-school organizations, faith groups and others, to teach them to create story maps, that follow negative news with maps showing where the news event occurred, and stories of why things like this keep happening, and ways tutor/mentor programs might help make a difference. Such stories would then point to existing programs in that area, and to assets, like businesses, colleges, hospitals and others who could help programs grow. Here's one example. Instead of only myself, or a few others trying to increase attention and resources for all programs in this sector, there could be hundreds of people doing this daily, which I think would help make events like #GivingTuesday much more effective for those who are trying to raise money today. While I use my blog as a teaching tool. I really don't have the money to keep the program locator on-line as a model for what others might build, or help me build. Nor do I have advertising dollars and/or professional talent to help me reach more people with my articles. Thus, as you decide who to support today, or tomorrow, or next month, click on this page and look for ways to help me do this work. One of the major challenges I'm facing is that since 2011, I've not operated as a 501-c-3 non-profit. I created Tutor/Mentor Institute, LLC to keep the Tutor/Mentor Connection, which I started as part of a non profit in 1993, alive for Chicago and as a model for other cities. I keep seeking partners, benefactors and/or volunteers to create a new non profit, but have not found any willing to take on the work done over the past 25 years, but have not found the few needed. So, I'm a social entrepreneur, with a wealth of ideas, seeking support to keep sharing these with the world. I've been creating visualizations to share ideas since the 1990s, thinking a picture is worth a thousand words, and you can see many in my blog articles. The one featured in this article is one of the most important. When I started the Tutor/Mentor Connection (T/MC) in 1993 my goal was to duplicate advertising strategies that big business use to motivate people to shop at their stores. I needed to find a way to do this without the money available to most companies to do this work. On one level, I've been sharing information that people directly involved in youth tutor/mentor programs can use to help build on-going programs that help kids move through school and into jobs and careers. At the same time, I've been sharing information intended to influence donors to become more proactive in supporting youth tutor/mentor programs already operating, and in helping new programs start where more are needed. Below is a graphic that you can click into to see these influence steps. Both paths shown on this graphic are important. I think influencing people who don't live in poverty to provide a consistent flow of time, talent and dollars to programs serving youth and families in poverty is going to be just as difficult as it is to influence the people leading existing programs, or starting new programs, to look past what they have already been doing, to new ideas of what they should be doing, if the goal is that the kids in these programs today are in jobs and starting careers when they are age 25 or older. I first used this graphic in this 2014 article. Browse this list and read more articles where I use this graphic. Can you apply this in your own efforts? However, there's also a third level of influence involved. 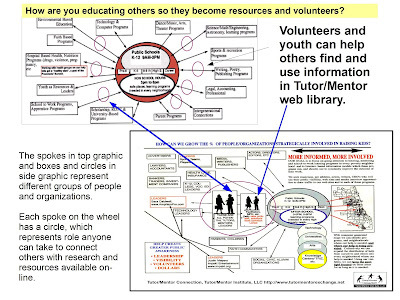 Since forming Cabrini Connections and the Tutor/Mentor Connection in 1993 I've tried to influence volunteers and donors to provide the talent and dollars both parts of our youth support strategies needed each year. 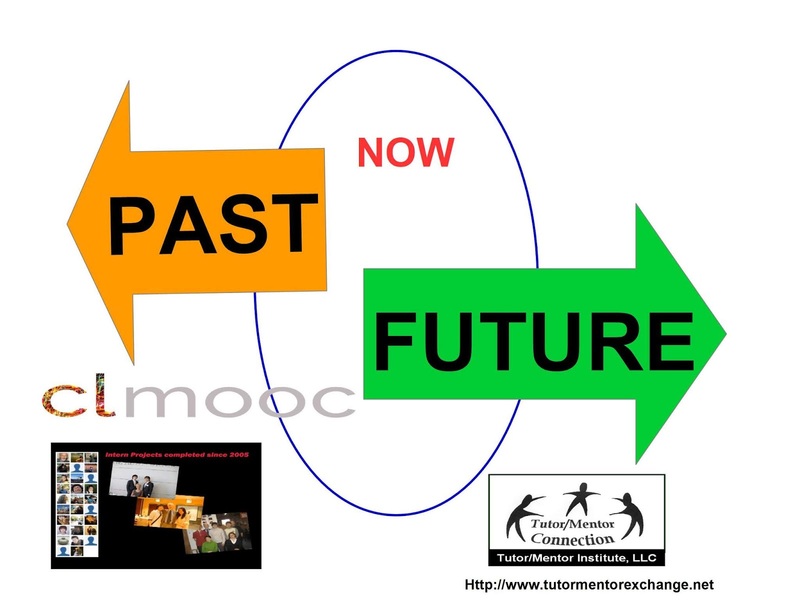 And, since forming the Tutor/Mentor Institute, LLC in 2011, I've continued to try find this support each year. It's never been easy. It's been much more difficult since 2011. 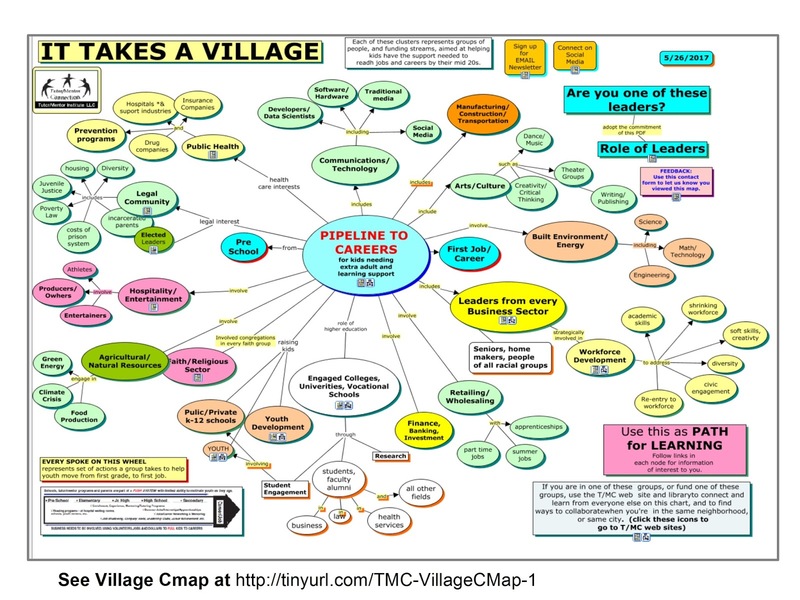 The concept map at the right is titled "It Takes A Village" meaning, people from every different sector of life in the Chicago region, or any other part of the country, should be involved in helping all kids move through school and into jobs and careers. With this in mind, many could be joining me in trying to "influence" actions of others. If you're doing this, or trying to do this, I'm trying to find and connect with you on Twitter, LinkedIN or Facebook. This also means that many people could also be helping me do this work. If you've read this far I hope I've influenced you to visit this page and send a contribution to help me continue this work. 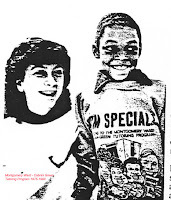 Below is a podcast interview with mentoring researchers David DuBois and Carla Herrera, who reached out to youth from the 1990s Big Brothers/Big Sisters (BBBS) research by Public/Private Venture and tried to determine long-term impact. Below the podcast are some of my own thoughts on this. In the early part of the podcast David DuBois talks about the lack of long-term research, and ties this to the lack of consistent, long-term funding of volunteer-based tutor/mentor programs. This is what I've been focusing on for past 25 years. 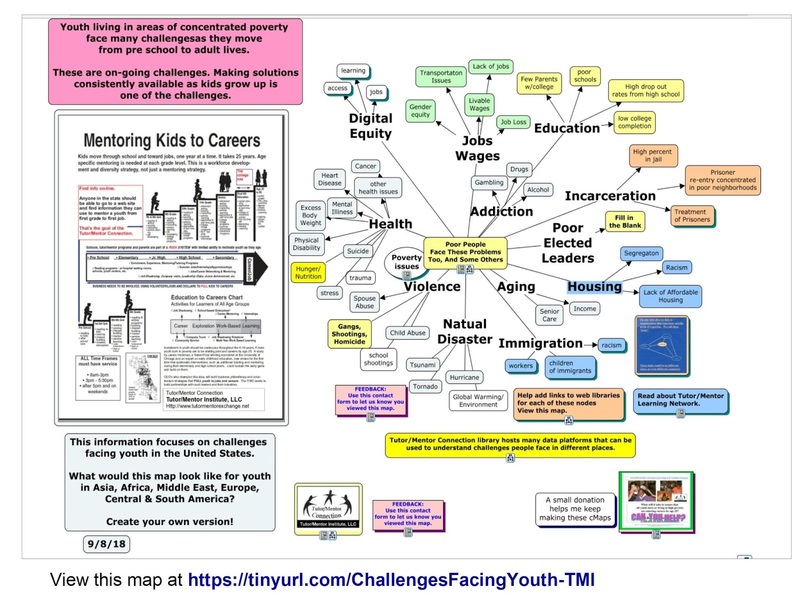 The rest of the podcasts describes efforts to find the 1200+ youth who were part of the 1990's study, and to try to determine how/if participation in this mentoring affected future work, education, justice system involvement, etc. It was a huge effort that resulted in survey responses from about 300. Rather than me trying to provide a summary, I encourage you to listen. While the research done by P/PV focused on the BBBS program, I've been building a database of all organizations in the Chicago region who include volunteer based tutor and/or mentor involvement as a core part of their strategy. Then I've tried to increase the frequency of media stories, and social media mentions, of all of these programs, with the goal of drawing needed resources though my database and directly to programs. This is part of a 4-part strategy developed in 1993 and still followed in 2018. I still don't find many who do this. 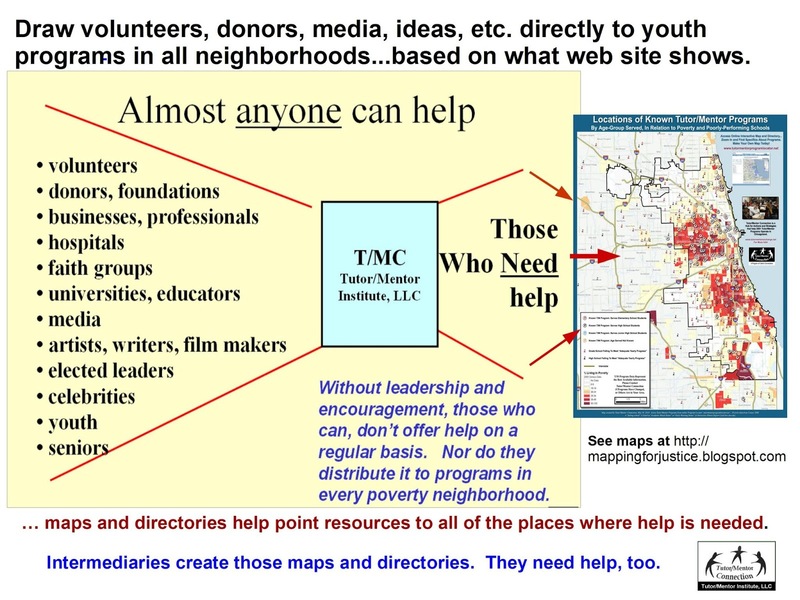 While the use of map-based directories is growing, most of this is intended to "help people find programs" and not to help build an understanding of service levels and program distribution, or to help improve the flow of needed resources directly to all of those programs, not just BBBS or other high profile programs. 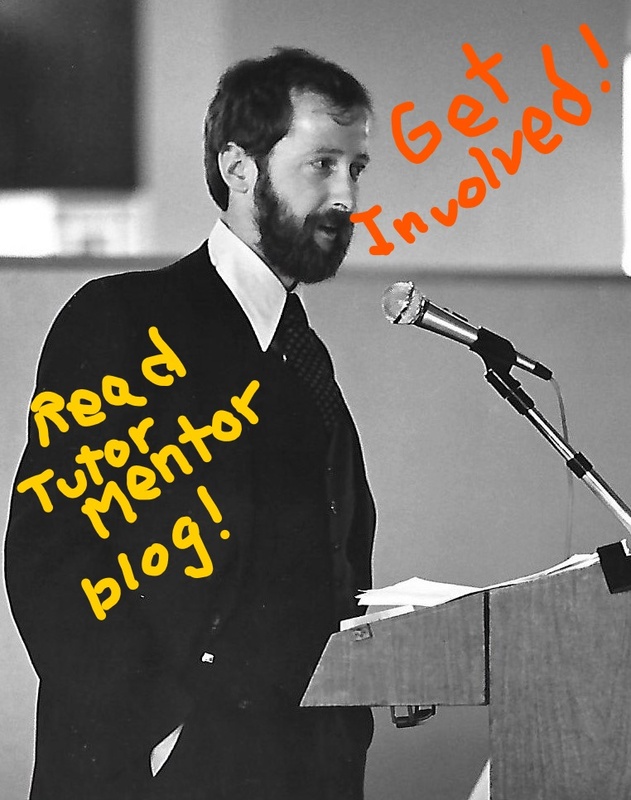 As you listen to this podcast, I encourage you to visit this 2007 article that I posted on the Tutor/Mentor Connection forum and follow the link to a Public/Private Ventures brief, titled Mentoring, Policy and Politics, written by Gary Walker, president of P/PV. He also shares that it’s not the most at-risk youth who are likely to be in traditional BBBS type mentoring programs. He writes, “Mentoring’s strengths, based on experience and data, are generally in the 8-through 13-year age range, and concentrated on 9-11-year olds.” As Walker states “They are youth with responsible parents or teachers who want to connect them with mentors”, not the youth who are most in need of mentors and more extensive adult support." In the podcast DuBois talks the duration of matches in the original research about how the length of mentoring matches has increased in the past decade. Since this lack of long-term research, or on-going funding of programs, has been an issue since the mid 2000s, why have we not yet convinced donors and government funders to provide more consistent funding to programs in more places? In the concluding minutes positive results from the follow up research were discussed and Herrera tells how the survey responses of many show that "these relationships really matter". I've receive similar feedback often from alumni of the tutor/mentor programs I led between 1975 and 2011. Here's a 2013 comment from one alum. I joined Cabrini Connections in 1999 and was recently reminded of the positive impact that it had on me. It profoundly impacted my relational abilities. I recall Cabrini Connections being a third place for me; it was my home away from home. The staff were beyond friendly; they took an interest in your life. My tutor exemplified this value as well. His name is Larry. Larry volunteered after work hours to help me with my homework. This was his only official commitment. However, he excelled beyond that and taught me more about life. A short list includes challenging me to strive for higher goals, do things economically, and instilling confidence in me. Now, I am am event supervisor and do volunteer work with a church. I have to talk with people routinely and I have the confidence and drive to excel in this. In part, because Larry believed in me when I was a teenager. Larry and I still talk from time to time despite that he now lives in Costa Rica. We Skype and chat on facebook. He still supports and challenges me occasionally like the friend he has become. Thank you Larry. 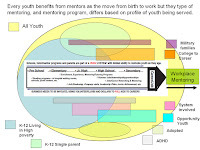 While I was closely connected to the National Mentoring Partnership in the mid-1990s I've never been an affiliate, or a part of their research process, partly due to my own lack of resources over the past 25 years and partly due to a broader focus on "mentoring as part of a larger strategy" and narrower focus on site-based non-school organizations that provide volunteer based tutoring/mentoring and a variety of learning and enrichment support to k-12 kids living in high poverty areas. Yet I regularly share ideas with David and other researchers via the listserve David has hosted since the mid 2000s (partially based on a Yahoo Tutor/Mentor ER Group (Evaluation and Research) that I launched around 2004 after David participated in one of the Tutor/Mentor Conferences I hosted in Chicago. 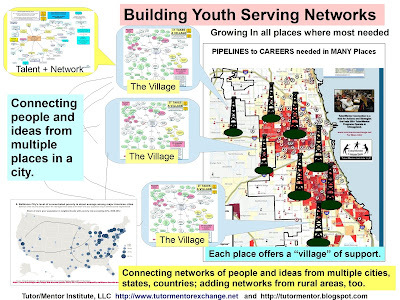 Then, plot this on maps that show layers of information, such as this map created by Tutor/Mentor Connection in late 2000s. It shows Chicago boundaries and expressways as the bottom layer, then shows poverty and poorly performing schools as the next. Then it shows locations of existing non-school tutor/mentor programs, from the survey we had done since 1994. Finally, it also shows assets, who could be helping programs in different parts of the city grow. In this map hospitals are shown. The goal is that each hospital create a research and planning team that builds a map like this for a 2-3 mile circle of neighborhoods surrounding the hospital. We put our directory in an on-line search page in 2004 and launched an interactive map directory, with these layers, in 2009. Unfortunately, the financial crisis of late 2000s cause us to lose financial support to continue updating this, and ultimately led to my need to create the Tutor/Mentor Institute, LLC in 2011. I've not been able to update the Program Locator since 2013. 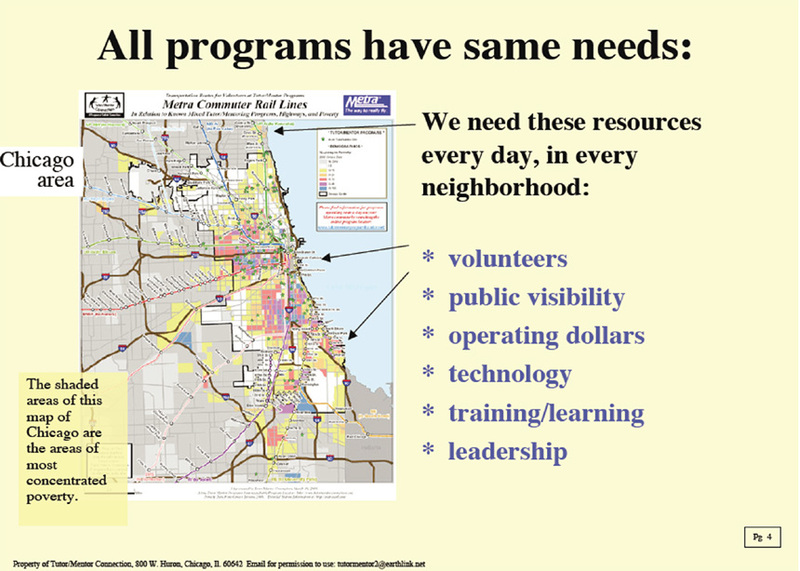 So far, I don't find others duplicating the 4-part strategy, or the program locator, in Chicago or other cities. Nor has anyone with wealth, doing research, leading a hospital or business, or university, read my blog articles and sent an invitation saying "let's meet" or offered to become a benefactor to support this work. 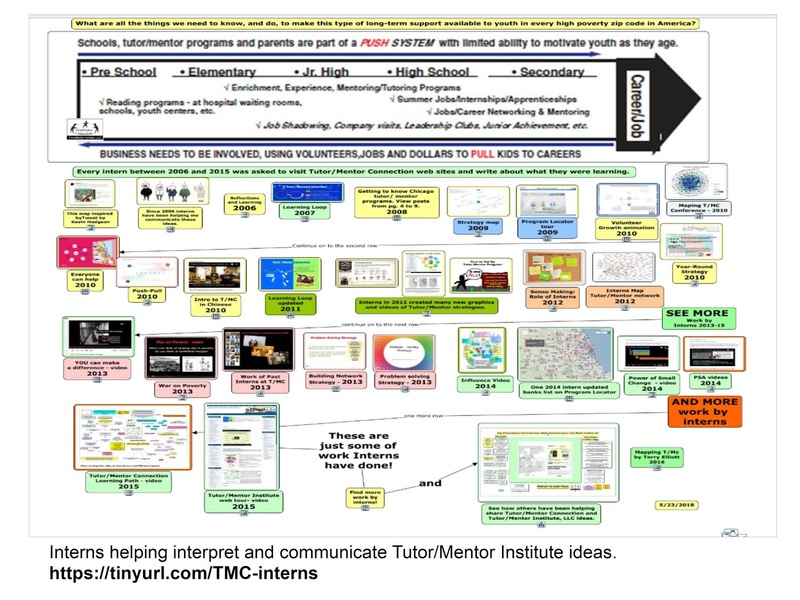 I share ideas and strategies and point to my list of Chicago programs on the Tutor/Mentor Institute, LLC web site. I encourage all to spend some time browsing the site and try to put the ideas to work in Chicago, or in other areas. I'd be delighted to become a consultant within your process. There's a link on the page to my FUND ME campaign and another to my 72nd Birthday appeal. If you value the ideas I'm sharing I'd appreciate your support.